I just launched Learn Lettering 2.0 which generated six figures in revenue by the second day and the launch is far from over. In this episode, I share insider tips that will make you thousands more on your next course launch. I talk about how to validate your course idea, how to get people to care about it, how to maximize your initial launch period, how to create urgency without discounting, how to close strong, how to promote on-going sales after the launch, and so much more. The Community members who listened live were saying it was like I just gave them $2,000 of value. If you’re not listening to this show, you’re saying you don’t care about $2,000. Whether you’re thinking about doing a course, planning a course, about to launch a course, or already have one that you’re wanting to supercharge and breathe new life into, you’re going to get ideas from this episode. Give the audience what they need, but deliver it in a package of what they want. Keep showing up and stay in the forefront of people’s minds. You have to get people to care about the course way before you release it. Good products sell themselves, but only when people know about them. The hard part is getting people to know about them. Get people to care about you first so they will care about your product. If you want to make an epic course, learn to write 1,000 words a day. Publishing weekly is good, but if you can produce high quality content daily, that’s when you win. Know your target audience and be confident about your price. Create urgency through bonuses and limited time availability. Sending a “Last Chance” email will add 40% more revenue to your bottom line. Always reward your loyal customers and early buyers. If you use someone else’s platform to sell your course, realize that you’re giving up control and they have the power over how your brand is perceived. 09:24 Sean: Today’s topic is pretty timely for me, because a couple days ago I launched Learn Lettering 2.0. I’m not going to be sharing real numbers yet. This is a show where we share real numbers, but not today. There’s work time and there’s talking about work time, and we’re still working. Matt is doing a course. Matt, when are you going to start working on that? 10:06 Matt: November. September or October we’ll start talking. I have a few ideas of what I want it to be, but I want to structure it to what the Community wants and what feedback we get. As time goes on, we’ll refine the idea I have in my mind. 11:58 Sean: Step number one in launching an online course is validation. You need to validate. A lot of people start out with, “I have this idea for a course that I want to make,” and they make what they want and nobody buys it. The problem here is you weren’t looking for what people were asking for. You don’t know what they wanted from you, so you have to find that out. The way you find that out is by creating content around your area of expertise, this thing that you want to teach. Create content so people come to associate you with this subject. 12:39 Then you solicit their questions. You can do this a number of ways, but one of my favorite ways of doing it is by setting up an email newsletter and an autoresponder, where the first email asks them what they’re struggling with. That way, you have an excellent survey with hundreds of messages from people so you can see what the most popular topics are. You could go straight to making a course from there, but I would recommend creating content around those questions. Put that content out and see. If you’re attuned to what people want to learn from you, then those posts, videos, or podcasts you’re making are going to do really well. You’re going to get disproportionally more downloads or views on those things than your other content. 13:37 Matt: Get those questions together, get content together, and put it out all for free. 14:00 Sean: Cory, what are your thoughts here? Are you thinking about doing a video course? 14:07 Cory: I am thinking about doing a video course. The industry doesn’t really matter. Asking questions about what people are struggling with is the biggest thing, because then you’re going to get people who are already sold on it. Once you produce some content in an email or blogpost that fixes a problem that person told you they were struggling with, they’re going to be on board and are going to be more likely to buy from you when you launch a course. 14:53 Matt: Shera and I were talking about this a couple of days ago. I was telling her about the course, and she was saying, “How are you going to know what people want? How are you going to know what their needs are?” It made me think that a lot of the stuff that I think is easy really isn’t, especially if you’re new in business. There are some things we all have to do. I’m going to have to go back to seeing all the basic things I need to do to get a business going. Let’s say I’m a 16 year old, and I’ve been following seanwes and doing lettering for four years now. 15:42 Sean: We have a 16 year old following this show, listening to Lambo Goal. It’s awesome, but I want to hear Matt’s answer to this. He wrote us and asked for money for his business. Matt, what do you think he should be doing? 16:02 Matt: He should be practicing as much as possible, becoming an expert at whatever he’s working on. If he’s good at whatever he’s doing and he has a decent business plan for how he’s going to market and get clients, I have no doubt that someone will invest with him. 16:48 Sean: He’s asking for hundreds of dollars or a couple thousand dollars; it’s not like this would revolutionize his vision, it’s just a little bit of money. 17:01 Matt: If it could give him focus for a couple months to pay his bills and focus on whatever he does, I can see how that would be beneficial to him even if it isn’t hundreds of thousands of dollars. That’s what I believe. 17:39 Sean: I believe this 16 year old kid needs to start spending his time hustling and stop spending his time asking for money from a bunch of podcasters. If you’re 16 and you’re starting your first business, do some work first. If all you’re hearing is the startup terminology of “getting funding” and that’s how you start businesses, that’s how you start a VC funded business, but that’s not how you have to start a business. A lot of businesses are bootstrap. If you’re 16 years old and it’s your first business, try and give it a go first. If you have a little bit of a track record and you can say, “I hustled, I built this agency, these are the results, and now I’m looking to scale it and I’m looking for some investments,” I think he’s going to get more traction that way. 18:48 Matt: He needs to have a portfolio, past clients he’s worked with, and some feedback from the clients before he starts asking for money. 18:56 Sean: Maybe I’m making a wrong assumption that at 16 he doesn’t have a portfolio. Maybe he does. 19:03 Matt: I think when I was 16, I had a portfolio and I had clients. If I had $2,000, I would have used that money to pay for my bills and get more clients, and I would have paid back that $2,000 in a month and probably had $10,000 in the bank. That’s the way I do business and the way I think. 19:24 Sean: Number one, I think you’re an anomaly. Number two, I think a lot of your current expertise is coloring your nostalgic view of yourself as a 16 year old. The chat room is saying that 16 year olds need to struggle when they get things rolling, not have cash handed to them. Alex says, “I’m 17, and I totally agree. There’s no bills at my age and nothing but time. You can do so much at my age, there’s really nothing to hold us back.” He’s 17 and he gets it. 20:04 Matt: When I was 16, I was already investing in the stock market. I was given a few thousand dollars and I turned it into $100,000. A little bit of help goes a long ways with the right mindset. I’m not saying to hand every 16 year old $2,000. I had a successful snow cone business. I was making almost $80,000 from that business, and then I had my lawn business that was making me about $50,000. You want the kid to have a portfolio and clients. You need to see if he has credit card transactions or proof of statement, just like any other business. When it comes to investing, don’t focus on age. 20:49 A 16 year old won’t be as mature as a 30 year old because of experience, but I can tell you that if the kid is in the right mindset, he’s listening to Lambo Goal and changing his mindset, this could happen. This is why I just turned $50,000 down to be on this show, not because I enjoy talking in a microphone. My time is valuable. If people can change their mindset, work hard, bust their chops, any 16 year old worth his salt can get a portfolio together, get some clients, and get it done. Like everyone in the chat is saying, you have no bills, so you can focus on your specialty. Then, when you get your clients and you have your business plan, you’re ready to start asking podcasters for money, and you will get that money and grow it 100%. 21:50 Never stop asking. I can’t remember how many people I asked for money just to get my lawn business going. The dude that did still thanks me to this day. At 16, you’ve got nothing but time. Work, work, work, and say no to fun. You’ll have fun when you get older. I get fiery about this because I’m 25. If you were to see my life, you would say, “This is unreal.” It is unreal, because we do unreal work here. We do unreal hustle. It can be done, but I have no fun. I barely have friends, but I can’t hang out with them, because I made a choice when I was 12 that I was going to be a successful business man and I was going to pay hard work when I was young so when I was older I could enjoy my life. 22:56 If you decide to make that same choice, I’m not saying be a workaholic, but get your priorities straight. Build the foundation for your business, get it rolling, and you’ll see that your business will take care of you. You will slowly be able to step away, and you’ll be set. You won’t need to ask for $2,000 because you’ll be making that an hour. Knowing that 16 year olds are listening to this makes me believe that we’re going to actually live in a decent society. 23:49 Sean: You need to build buzz. Let’s say you have your validated idea at this point. You know what people want, you’ve put out content, and that content has done tremendously well. Now, you need to decide that you’re going to do a course. That’s probably what you’ve decided already, but I wanted to take a step back and make sure that you’re doing the right course that people are actually going to buy. Now that you know that, you need to build buzz. You need a minimum of six months that you announce a course and work up to it. That’s what I would do. That sounds like a long time. 24:26 Matt: During this time, as your building the buzz, are you taking the feedback and building quality stuff around it and then sending it out on top of building the buzz? 24:36 Sean: You’re announcing it before it exists, and you’re getting people hyped. Building buzz comes from Backwards Building. 25:19 The first way to do this is to announce it well in advance. Don’t try to launch a course in three months and try to turn it around. I won’t even notice. People are busy; they don’t notice announcements, they notice consistency. You’ve got to keep showing up and stay in the forefront of people’s minds. For Learn Lettering, I posted a blog post every day for 30 days in a row. It was a lot of work. There were still some people who hadn’t heard about it. It’s insane. You’ve got to stretch out that time and invest. Invest six months minimum. Announce the course and don’t expect anyone to care, but keep driving traffic to that landing page. 26:18 Create a landing page to build buzz. Write the landing page as if the course already exists—what it is, who it’s for, and what it’s going to do for you. You’re doing this based on the target audience you want to reach, the feedback you’ve gotten that validated this idea after you put out content, so you say on your landing page, “This is going to help you with this. You know how you’re having trouble with this thing, this is going to tell you the solution in a way that’s going to save you time.” That’s how you’re writing this, and you haven’t even made it yet. 27:06 Capture interest. People are only going to come to this once. You have one shot with a lot of people, and you need to capture that. If they just go to your landing page and nothing’s there yet, they’re going to go away and never come back. Capture them with a sign up form. 27:26 You put this promise out here. You say, “This is what this course is going to be and what it’s going to do for you,” and you essentially put the press release as if it’s done. That’s your landing page. Now you have to actually make that. You haven’t made it yet, but by Backwards Building, you’ve put a stake in the ground and told people what the course is going to be so people have time to get excited about it. It makes sure you know exactly what you have to make, because you can’t get distracted now. You can’t say, “Maybe I’ll add this or change this.” You promised what it was going to be, so it gives you clarity so you can work toward building this course. 28:19 What percentage of the work should be on marketing versus actually creating the product? This might sound crazy, but I would say absolutely no less than 50/50, but I might even say as high as 80% marketing. The single most important thing is getting people to care. It doesn’t matter if you have the best product in the world if people don’t know about it. It’s not going to sell itself unless you have some kind of track record or existing brand recognition. When we say, “Good products sell themselves,” that’s when people hear about them. When people know about good products, they continue to sell themselves. 29:12 When you know about the iPhone, it continues to sell itself. You talk about it with your friend, everyone hears about it. That’s why I err on the side of marketing 80%. Your problem is that people don’t know, so people don’t care. People need to care about you as a person. That’s how you’re going to get people interested in the beginning. You could focus on the product, you could just say that the product is so great that they should care, but that’s going to be harder unless you have a really big marketing budget. Otherwise, if you’re bootstrapping this, starting with your own money and doing this from scratch, you need to get people to care about you. 30:29 Cory wanted to make this film. He’s wanted to make a short film, and he was thinking that he would spend a bunch of time making it and put it out, and it’s going to be so awesome that people will love it. The problem is that people don’t care. He also wanted to sell this. He worked really hard; he’s paying actors and showing up, and it’s a lot of work. He wanted to sell his short film, even if it’s for $6 to $12. 31:11 It’s not going to work, and the way I would recommend going about it is this: provide a bunch of value about video itself. Now, Cory said, “I don’t want to teach video, I want to make short films.” I told him to get people to care about him. Niche down, curate, and give people value. Teach what you know, and get people to care. Do a weekly video show, because then everyone will be excited—“Awesome, Cory’s episode is out!” Suddenly, Cory makes this short film and he starts mixing in his behind-the-scenes in his teaching videos. He’s bringing all of this in, and eventually it will go live and people will buy it because they care about him. They care that Cory made it, not because there’s a short film they would spend $6 on. They care about you because you’ve given them value. 33:02 Kieran asks, “Audio courses, good idea or not—if it’s suitable for the material of course?” Video is the most difficult of all the mediums to produce because it takes the most amount of work. If you have podcasting, it’s just audio. If you have writing, it’s just words. You can take as long as you want to write, edit, and rearrange it before you post it. Audio is live, so you can chop it up a little bit, but there’s less freedom and flexibility because it’s recording. With video, you have everything you have with audio—which still needs to be top-notch—but you also have the visual: lighting, color correction, delivery, different cameras, and it’s just a huge production. 34:01 It’s a lot of work, but in exchange for that, you have a really high value perception. If I put out the 100,000 words I wrote for Learn Lettering 2.0, which is still in it’s introductory rate, people would not have paid the price it is because of the value perception. All of those words, however many, are in the course. It’s like a book, but there’s also video, so the value perception is higher. If you want to do a course, you should do video, unless you don’t care about money. If you’re going to do video, you need to do a good job. 34:57 Matt: I can’t just use my webcam or GoPro? 35:00 I don’t think you should. With that said, if that’s all you have, it’s a mindset thing. We probably have $30,000 worth of camera gear. I’ve been investing for years, because I care a lot about the quality. I didn’t start out with that; I started with a single camera. It’s an investment, but you should work toward that. Does that mean you have to spend $30,000 before you do a video course? No—it’s about your mindset. If all you have is a GoPro, don’t use the built in audio, but get a mic. 35:38 Don’t just shoot it wherever and ignore the white balance. Close the blinds, pick up a $20 light at a hardware store, look up how to diffuse the light and reflect it. Hustle and make it look good. Spend a ton of time on post-production and color correction and make it look decent. Cory, you’re a video guy, so you know what goes into this. If you’re going to produce a course, do you feel like everything I’ve said is a lot of pressure, or does it make sense? 36:28 Cory: I don’t feel pressure, but maybe I’m not the best person to ask. I feel very comfortable with what I would do and how I would do it. My process always starts with writing, and I still have a lot of that to do. I plan to write maybe ten lessons, but I’m only on four. Once I write it, I’ll go back and perfect it to see if it flows well. Do I really want this as the first lesson? All that kind of stuff. Then it’s just a matter of doing it and doing your best work. 37:40 Sean: If you want to make a course, you need to learn to write 1,000 words minimum a day. Do more. I wrote 100,000 words in six or eight weeks. That’s what it takes. If you want to make an epic course, you’ve got to learn to write. If you can’t write 1,000 words a day, you need to stop thinking about doing a course and start thinking about showing up every day and writing. Everything you do starts with writing, whether it’s a blog post, podcast, videos, or a course. No one is going to pay $497 to see you show up and ramble. We have hours upon hours of lessons for Learn Lettering of highly scripted, highly edited material. It’s pristine quality. 39:44 I know that I would make more sales if I did payment plans. I know that if I did discounts for someone because of the conversion rates from their country, that’s the economy. That’s the market. That’s real life. Because I make my courses to be ten times the value, it holds its value no matter what. If you just want the business modules, it’s still ten times as valuable. Buy the whole thing. Stop asking me for half of the modules. I get people writing in asking for discounts; it’s already introductory rate, and they want it even cheaper. You’re going to get that every time. 40:40 I got an email from someone who said, “In my country, this course is a month’s wages. I couldn’t have spent my money better.” I get more opposite responses, but those people are not my target audience. Know your target audience and stick to your guns. 41:11 Matt: If they don’t want to have the discipline to put that money away, like Sean’s saying, the course isn’t for them. They’re not going to be dedicated and take in that information like someone who is going to put up a month of their wage. They’re going to appreciate all the time you put into that course and soak it up. 41:29 Sean: There’s your litmus test. Are you ready to produce a course? The answer is, are you ready to write 1,000 a day? Are you doing that? Can you do that? If not, you have no business doing a course. 42:03 People don’t notice announcements, they notice consistency. If you want to do something, do it consistently. If you think you care about something and you want people to care about it, do it no less than weekly. People live their lives in weekly cycles, and it resets every week. They do their routine, watch their shows, and it resents, so if you do it less often, people don’t care at all. Weekly is minimum, daily is the key. Less than weekly, you don’t exist. Weekly, okay, you can play. 42:51 I’m not talking about some measly 400 to 600 word blog post, let’s get into the thousands here. Let’s hustle. Let’s put something out there. I’ve preached this stuff, and then I actually did it with my 30 day blogpost series. It was a total of 45,000 words, and I did it all in a row. For various reasons I’ve talked about on other episodes, I set the deadline that I did, and I did the amount of work that I did in a certain amount of time, which was a little bit intense. 43:26 I would recommend that you don’t necessarily do a new post every single day, but you could build a queue in advance. Cory’s doing that; he’s writing ten in advance, and that’s going to help him out a lot. If you wrote fifteen of your daily blog posts in advance, during the full 30 days, you could write a blog post every other day and be fine. 43:53 The key here is to get on people’s radar. You need to provide content daily if you can. I messed this up with the first launch in 2014. I announced it six months in advance, so I got that part right, but then I sent five emails five days before it. That was it. They weren’t even valuable emails. 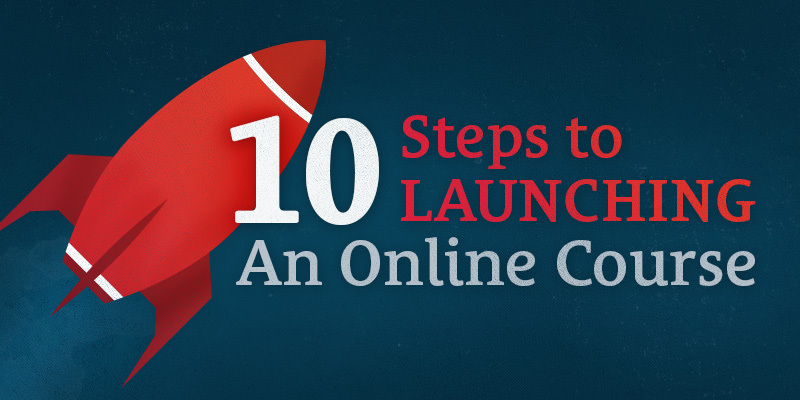 The emails you should be sending in the launch sequence aren’t, “Buy My Course! Reasons to Buy My Course! You’ll be Awesome if You Buy My Course!” It’s giving people value around the content of the course. Give away some of the course—take 10% of it and give it away. 44:43 I did even more than that. I gave away four modules out of 15 or 16, as well as several lessons from the master class. They’re free on YouTube for anyone. I wrote a ton of stuff that’s in the Master Class and baked it into that sequence. Give it away. You’re staying in the forefront of people’s minds, and they’re realizing that you’re the person to go to for value on this subject. 46:28 There are several ways to create urgency. The worst way is to discount everything and devalue all of your products, but this is what a lot of people do. They discount, run a promotion, and later on they’ll do some more coupons. It’s terrible; don’t do that. 47:08 You can also create urgency through scarcity. If something is scarce and there’s only a certain amount, that creates urgency. You can’t create false urgency. If you have a digital product like a course, you can’t say, “There’s only six courses left!” False scarcity doesn’t work. If you have a physical item, you can mix these together: bonuses and scarcity. Maybe you say, “The first 20 people to buy this course get this t-shirt or will be mailed a physical guide,” or something like that. That’s a physical item, and you can totally say that there are only 20 available. That makes sense to people, because that’s true scarcity. 47:59 You want to create some sort of urgency. If you’re just launching and saying, “Hey, it’s available,” you’ll make some sales from the people who are really excited, but most people need an incentive to buy. People think, “I’ll get around to it. I’ll do it later.” If they think that, it’ll never happen. They will never come back. You need to give a reason for them to buy now. I’ve mixed these together. I release my courses at an introductory rate—this is the early rate for the launch, for the people who are signed up and are excited to buy. I regularly increase the price of my products. I will increase the price and never bring it back down. 49:08 I will actually release it at a certain price, increase the price, and it never comes back down. That’s not discounting. The fact that you know that I’m going to increase the price isn’t a sort of flash-sale, but I’m launching at an introductory rate that you can take advantage of, because then I’m going to increase it permanently. Look at my track record. When I launched the first Learn Lettering, I raised the price $50, and people still bought. I said, “I’m raising the price in 48 hours and it’s never coming back down,” and the first time people didn’t care, but the next time they realized that I was being serious. I sold $50,000 worth of courses in a weekend. 50:04 Now, the problem is, you need the margin. You need the head room to raise your price. If I can’t confidently say that this is worth ten times what I’m asking, I need to add more value or the price is wrong. If I have that head room, I can keep going up. I found that sweet spot, and I stopped increasing the price. This is where people start freaking out, thinking, “I need money, so I’ve got to squeeze some revenue out of this. I’ll run a discount, do a bundle, or put it on a deal site.” You’re devaluing your products and you’re devaluing your brand. I now think of your name, you as a person, and your products as discounted, devalued, and cheapened. 51:05 I’ll tell you what I did for Learn Lettering. In the future, I’ll tell you real numbers on a seanwes podcast. I launched the course at $447—it’s 15 modules and 75 lessons. You can’t really wrap your mind around that figure until you see it. If you go to LearnLettering.com and see the immensity of the course material, you can scroll and scroll—there are modules with tons of lessons, and each lesson is 10 or 20 minutes long. It’s insane; it’s so much value. People saw this and said that this is worth thousands, but there are also people asking for discounts. I had the head room to go up. 52:34 You should use tiers when you’re selling products (Related: e160 Nailing Your Product Launch the First Time). The Master Class is $699, the Intermediate Class is $299, and the Starter Class is supposed to be $99. It has mainly three modules, and last time, my old Intermediate Class had three modules and I sold hundreds of them at $99. This time, I had a crazy idea, and I decided to give away the Starter Class. It’s $99 value and hundreds of people would have bought it, but don’t worry, I gave them a special upgrade option for the new version. In the two days since it’s launched, my video hosting bill is 600% over capacity. Four figure bill on the bandwidth, and I’m giving this away to thousands of people. 53:43 As of this recording, close to 4,000 people have signed up for the starter class in less than two days. They’re watching this high quality material on premium video hosting that I’m paying for. I’m being a little bit crazy, and I’m not saying that this is necessarily what you need to do, but it’s what I did. The first time, I sold the Starter Class for $29, and as soon as you put a price tag on anything it cuts out a lot of the free people. I tried to create a story here, so the story is that I should have sold this for $99 because I sold the exact same amount last year for $99 and this time I added more, but I decided to give it away. 56:22 I get tweets like that every few minutes around the clock. Compare to what else is on the market, these cheap $19 or $20 classes that are basic, just a few lessons, not a Master Class with 75 lessons of business stuff. They’re trying to hit the low end of the market. You could pay $29 for a shallow class or you could get $99 worth of a premium class for free. I’m hitting both ends, bringing people in on the low end. Remember that 30 day sequence I wrote? This now gets repurposed. Someone buys the Starter Class, and they start getting emails automatically, these 30 day emails I already wrote, interjected with up-sells. Over time, a percentage of those people convert, they upgrade. 57:47 It pays off. That’s the reason the launch is different this time. We’re still talking about creating urgency, and this time I didn’t do a short launch. I’m giving away a ton and I’m paying to do it, and I know that’s going to hurt my initial sales. I wanted it to do better than the last launch, but I know that I’m giving away so much that some people are going to think, “I was going to buy it, but I might as well get the free one and check it out.” People have got all this free material to go through, so if I did a 24 or 48 hour launch, it wouldn’t be enough time. I decided to extend it. There’s that initial bonus period, but the introductory rate doesn’t end until August 9th, 2015. You can still get the master class at the introductory rate. 58:58 At the end, I’m going to push it a lot more, because it’s going to be the very last chance. I’m increasing the price and it’s going up permanently. So this time, I spread it out. I am happy to say that the launch has done better than the first launch, but it’s far from over. There’s a lot of people who are still in the free stuff that will convert at the very end. They always wait till the last minute. A lot of people set a launch window, push it really hard at the beginning, and then say, “It ended, you missed out.” They should have sent a last-chance email, saying, “This is the last day, go take advantage because it’s going away.” Then, send another last-chance email at two hours left. 1:00:38 Matt: Just from learning from Sean, I wouldn’t do discounts. I would probably throw in a bonus of some sort, because if I add something, that wouldn’t take away from the price but would provide more high quality. 01:02 Sean: It’s a brilliant way to do it. Add another lesson, add another module, add another bonus, and say, “I just made this new thing and added it, so it’s now even more valuable.” Give it to all of your previous customers—always reward loyalty. The people who buy from me first always get the best deal. They get the best price and the most value. The people who discount are screwing their loyal customers. 1:01:40 It’s not the discount bin, it’s the middle-finger bin. That’s what it is to the previous customers. I bought a course, and then I saw it for free on a discount site. Imagine how I felt—it wasn’t good. I felt like I was cheated. I never wanted to go back and buy from that person again. It’s this short term thinking, this “How can I squeeze all the money out of this first sale?” Guess what? You’re never going to get any more sales; all you did was squeeze money out of one launch with no long-term sustainable business plan. Who’s going to come back and buy from you? 1:02:32 Not me, and I was going to. I enjoyed this course and got value out of it, and then it was the strangest thing. It went from feeling like it was a valuable course, that I actually recommended to many people, to me feeling cheated. I felt like I should have gotten my money back or something, and that’s a weird feeling because I just went from feeling like I spent my money well to thinking, “Look at all these people getting it for free. I must have been cheated.” That’s terrible. You don’t want that for your customers. Add value. Instead of discounting, create new stories and new content around your product. 1:03:23 In our case, we could keep making videos, add modules, write new posts, add some sort of bonus—be creative and add more value. It’s the content thing. A lot of people want to promote their course and keep saying, “Go check out my course.” Spam, spam, spam. I say, create new content that is contextually around the topic of your course as an excuse to get people there. “I just made a new video as a screencast showing you how to do this. If you liked it, go check out the course.” Awesome, that’s value and it’s an excuse to get in front of people and promote your thing, because that’s what people actually resonate with and how you avoid being seen as a spammer. 1:04:57 You don’t want to just let your promotion period end—close strong. Do a webinar. Do a live event, where you teach some of what’s in the premium version of the course, and treat it like a presentation. What can you teach people? It’s not just, “Go buy my thing.” I don’t like that, and neither will your audience. You have to give them some value. At the end, do a live event and teach people something that’s in the paid version of your course. Give it away—stop being stingy. Stop worrying that no one is going to buy it. They’re not going to buy it unless they see actual value from you. 1:05:41 You can’t make it this big mystery. People can’t go as in depth with a podcast or video as they can with a course. If they go into a course, they’ve got all these modules and lessons, they can mark it as complete, they can take their time, they can come back day after day. They’re not going to do that with a podcast. I can give people “Ten Steps to Launching an Online Course,” and do it in a podcast and people can listen to it for free right now. 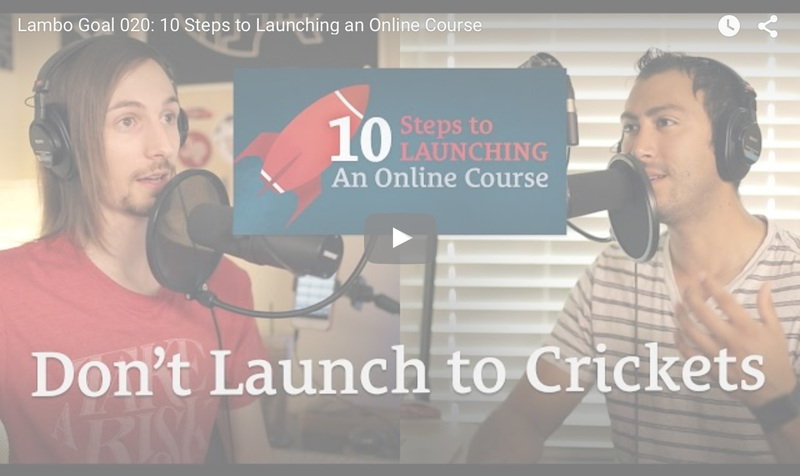 But, if I made a course on launching courses, I could really hone down these ten steps, break it down, and do videos, case studies, and detailed stuff. 1:06:28 The people who really want that will get more value from it. I can give this away for free and not worry about it. Don’t worry about giving stuff away. Close strong, show up, provide some value, and then say, “This offer is going away, the bonus is no longer available, and the price is increasing permanently.” Close strong and don’t forget the end of the promotion period. Your product is only valued at whatever you’re willing to sell it for. If you discount the price, that’s what it’s worth. 1:07:48 This course, the thing you’ve poured your life and soul into for six months, is nothing. This is only the beginning. It’s a little blip. Right now, you’re looking ahead and you see this big mountain ahead of you. Stop thinking like that and zoom out. You’re hustling, showing up, and suddenly you’re having the biggest spike ever—that’s what I want you to think about. This is Lambo Goal here, and we think big. This course you’re going to do is small. It’s the beginning. Don’t be afraid to lose money or break even, because it’s not about this course—it’s about the long-game. 1:09:08 It’s about your brand perception. Why should people care about you, come back to you, and continue to buy from you? Your first course is the first experience people have with you. Set the precedent. Hire a professional video crew, to the point where you’re going to lose money, if you care about winning. I’m dead serious here. If you care about losing and you want to be a loser, then squeeze all the money you can out of this. Stop listening to me and go plan your discounts. Get some more money out of the biggest mountain you’ll ever have in your life. Meanwhile, to me, that’s just a little blip on the radar. 1:09:53 This is getting people conditioned. That’s why I’m giving so much away, why we have multiple courses that will cost us thousands and all kinds of expenses to produce that I’m going to give away. Pure giveaway, because I’m about the ten-year game, for the future when I’m charging thousands for courses. It’s coming. You’re going to buy them because you believe in what I’m doing, you’ve gotten value from them and it has changed your life. It has changed your trajectory, your thinking, your mindset, and you’re seeing results for it. You’re making more money, your brand is higher quality, and you’re working with better clients. People actually care about your content; they open your emails because of the value that I’ve given you. That’s why you’re going to buy it, but that’s years from now. I’m going to have hustle for years. Should You Launch Your Course On Your Own Platform? 1:12:19 Sean: Devin asks, “Should you spend money on your own platform to launch your course or go on someone else’s for your first course or two?” I learned the hard way; I did start on someone else’s platform, and it ended up not going well. It depends on how you look at it. I rarely see things as failures because I’m always looking for the positive: what have I learned? What can I take away from this? I don’t think it was a failure. I did get thousands of students on this other platform. 1:14:11 The best I could do was get them to deactivate it from getting future students, but I could not remove my content. They wouldn’t let me. It was terrible. Did I learn things from it? Yes, I did. Did I get my feet wet with teaching? I did. Do I recommend it? I don’t. I recommend that you start with a workshop in person. Get with real people. Stop guessing at what their struggles are and find out. Say, “How’s it going? What can I help you with?” Learn a ton from that. Do more of those, and eventually do a course. 1:15:09 They control whether your content is discounted and whether you get to set a good price for it. Do you want to make 40% of $19? It got even worse. I could not only no longer set the price of my own course because they locked it, but eventually they switched to a membership system and didn’t ask or tell me. They changed their whole platform and everyone else seemed to go along with it. Now, you just get a cut of their membership. Every time they promote the course or you promote your own course, you’re promoting their membership. It’s no longer about you, your material, or your value. Someone’s going to pay a few dollars a month to get access to this. 1:16:07 Compare that to me, charging three or four figures for a single course. It’s all about how you want to be positioned. If you want to be in the discount bin, if you want to be cheap, if you want your brand to be devalued and someone else have control over it, go join another platform. If you don’t, you need to build your own platform. It’s a lot of work. It’s worth it if you’re on board with number ten, the long game. It does take a lot of effort. There are some solutions out there, and some are easier than others, but they have less control than others. 1:16:49 I’ve used WooCommerce and Sensei, which is their teaching integration. You also have to have groups integration, and if you want to have subscriptions, you’ll need subscriptions. There’s a lot of plugins, and it does take some development, but in my opinion, it’s been very much worth it. 1:17:15 Robert asks, “When launching your first course, should you create tiered content, or should you give people a sense of the value of the basic content before expecting them to want to buy into a higher tier with more content?” You do want to create tiered content. Let me tell you what to do in most cases. I haven’t always done this, but for good reason. In most cases, you want to have your product. Let’s say this is a book or something like that. Three is the sweet spot for tiers, because it lets people feel like they have choices without it being too much. If you give people three choices, they’ll think, “Which one do I want?” If you give them one, they think, “Do I want it or not?” You’re going to miss out. 1:18:24 Say your product is a book. The three tiers you want to create are above and beyond the book, not the book, two thirds of the book, and one page of the book. You don’t go down, you don’t cripple it, you add value. Start with the book and then go up and say, “Here’s a book and a guide, some videos, recordings, and interviews with experts.” There’s tier two. There’s a sweet spot of 1x where it’s just your book, 2.2x the price, and then 5x the price. For the 5x, you’ve got to be really creative. Maybe that includes a membership, a community forum, or a one hour consult with you. Be creative and add some value. Not a lot of people are going to get the highest tier, but if you just do the book, you miss out on a ton of high end revenue potential. 1:19:28 There’s a ton of people who want to spend money, who will not even consider something unless it’s a certain amount. I’m guilty of this because I like premium things. Now, I have to tell the story of my chair breaking. I’m working hard and I lean back in my chair and it snaps. The back just broke off, and I’m lying on the floor with bruises. I set out to buy a chair and said, “I’m not paying less than four figures for a chair.” I’m looking by price. I’m buying a nice chair. I deserve to be comfortable and I don’t want my back to have bruises. I bought an Aeron chair, and I bought the nice version; it was $1,200. If you assume that everyone is looking for cheaper prices, you’ll miss out on a ton of revenue. 1:21:35 You’re missing people like me, who only want to buy this if it’s serious. I could probably buy a $400 or $600 chair and maybe never be on the floor with bruises. Maybe, who knows? It’s worth it to me to have that piece of mind. Someone out there is looking at your course and thinking, “Only $199?” I want to learn character design. I want to be a legitimate artist here. You must not even know what you’re doing. How can I pay my bills with $200 a month? You’re expecting to teach me to make a living as a character artist for $200? Obviously, your course is not in depth enough for me. You don’t know what you’re talking about. Don’t miss out on a high end revenue potential. I did it wrong. I crippled my product. 1:23:07 For my first Master Class with Learn Lettering, the actual product was the ten module class. I crippled it by saying, “Get part of it and it’s cheaper.” Later on, I realized that I left some revenue potential on the table. I could have gone up. Forget all the people who want to spend $29. Here’s the class, it’s $300. You can buy the class, or you can buy the class and get access to a community forum. Or, you can buy the class and get access and receive a one-on-one consultation, portfolio review, or a group coaching calls. Get creative. Only ten people do it? If you charge $999 for that tier, that’s not bad. Are you arguing with an extra $10,000?